Where <resource_type> is a Keystone resource, such as user or project, and <operation> is a Keystone operation, such as created, deleted. The key differences between the two notification formats (Basic and CADF), lie within the payload portion of the notification. Where <resource_id> is the unique identifier assigned to the resource_type that is undergoing the <operation>. The following table displays the compatibility between resource types and operations. To turn on notifications in keystone we should update keystone config /etc/keystone/keystone.conf . First of all set notification driver(s) to handle sending notifications. or drivers. noop - disable sending notifications entirely. 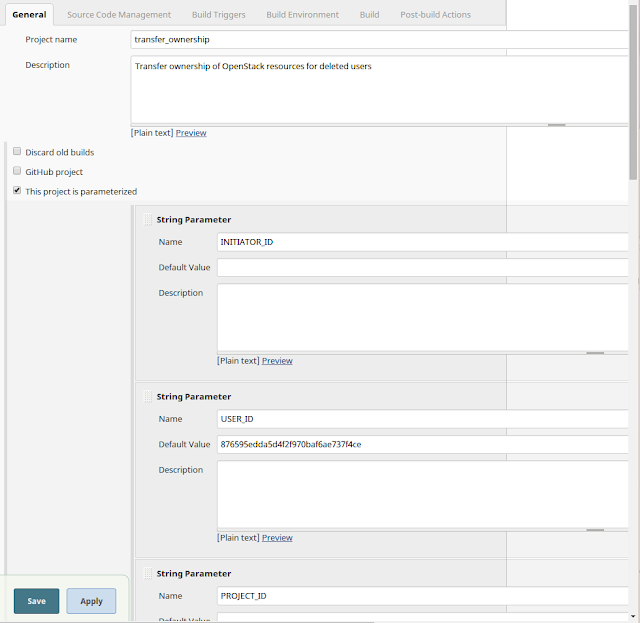 If you are using devstack you should have RabbitMQ installed and configured. Otherwise you should install and configure RabbitMQ. 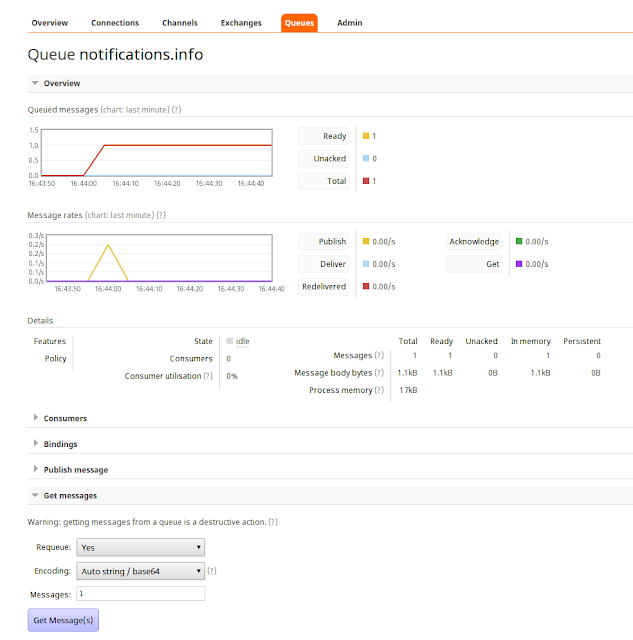 Messages in log file and in the RabbitMQ contains same data. 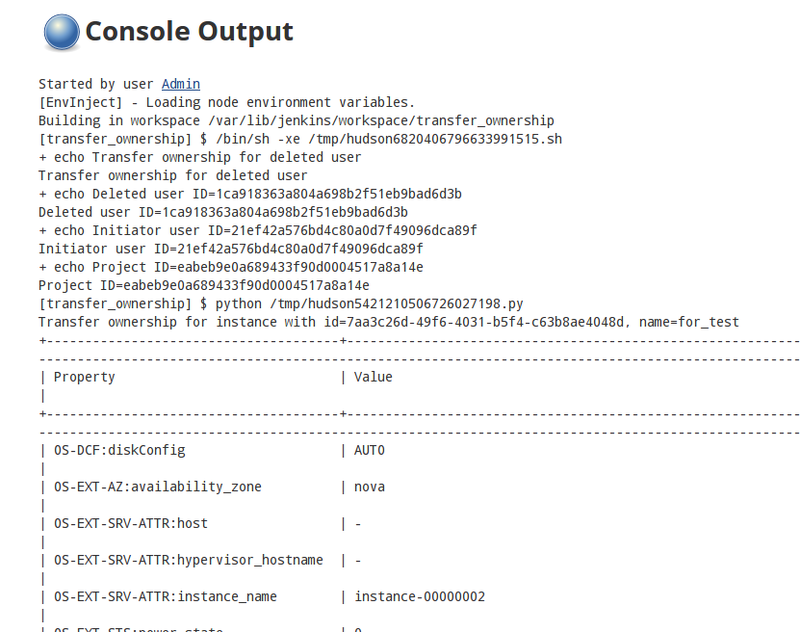 We are going to use OpenStack Aodh to consume Keystone notifications. Aodh's goal is to enable the ability to trigger actions based on defined rules against sample or event data collected by Ceilometer. 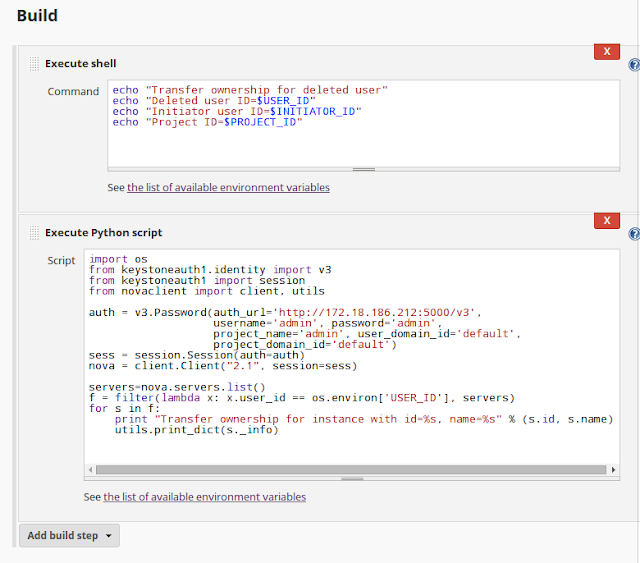 Aodh allows users to define alarms which can be evaluated based on events passed from other OpenStack services. 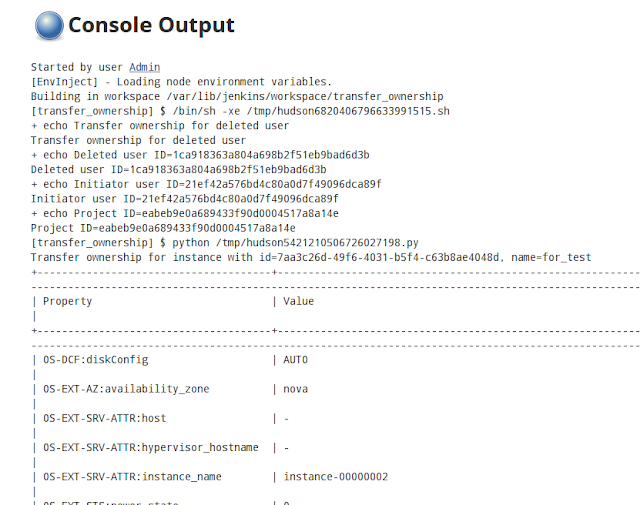 The events can be emitted when the resources from other OpenStack services have been updated, created or deleted. Config the Ceilometer to be able to publish events to the queue the aodh-listener service listen on. The event_alarm_topic config option of Aodh identify which messaging topic the aodh-listener on, the default value is “alarm.all”. In Ceilometer side, a publisher of notifier type need to be configured in the event pipeline config file(event_pipeline.yaml as default), the notifier should be with a messaging topic same as the event_alarm_topic option defined. We are keeping default devstack Aodh configuration. The alarming component of Aodh, first delivered in Ceilometer service during Havana development cycle then split out to this independent project in Liberty development cycle, allows you to set alarms based on event. HTTP callback: you provide a URL to be called whenever the alarm has been set off. 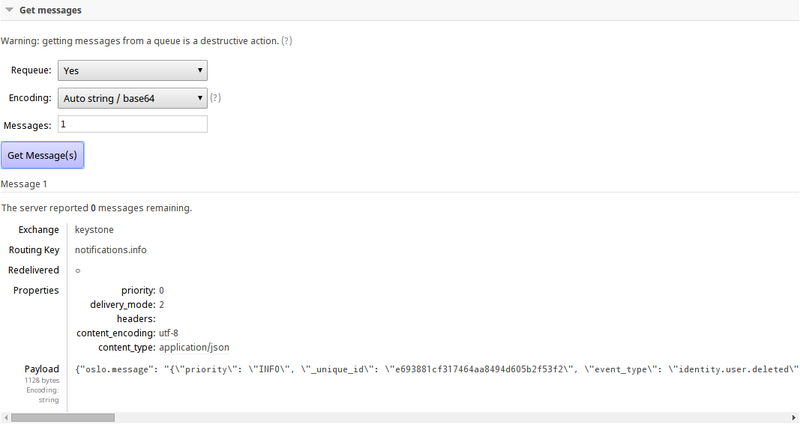 The payload of the request contains all the details of why the alarm was triggered. log: mostly useful for debugging, stores alarms in a log file. zaqar: Send notification to messaging service via Zaqar API. Let’s create alarm for a Keystone ‘identity.user.deleted’ event. Aodh calls such alarms “event alarms” and has a special type for them. We are going to use HTTP callback action for the our alarm. Aodh uses HTTP callback action to send POST HTTP request to some address. At this address you should have some HTTP server (we will show simple example below in this document). It is very important to understand that you can not specify HTTP request headers or data. Everything is not configurable. We have an error “Failed to establish a new connection”. It is because we don’t have any web server at http://localhost:5123. We created an event alarm in Aodh and it’s sending POST request to http://localhost:5123. 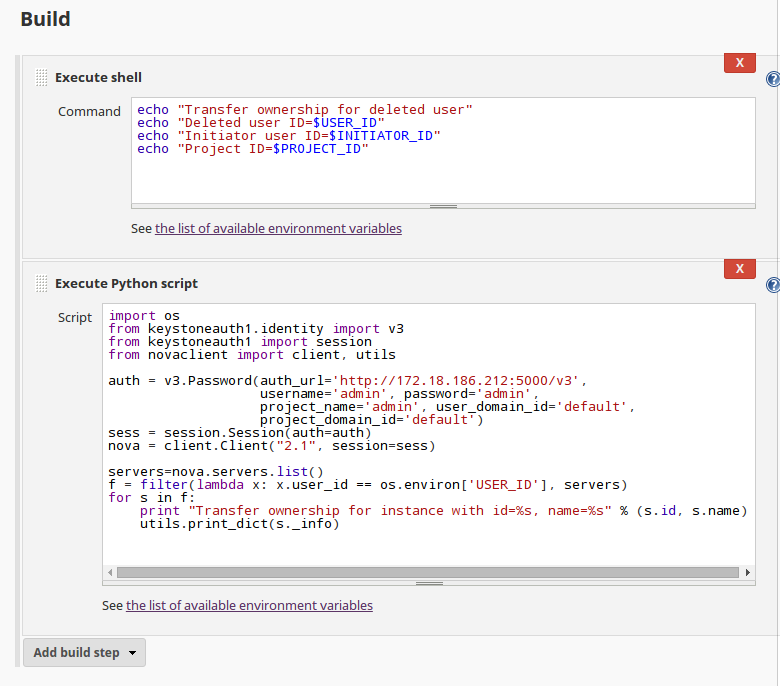 Now we have to write our web server. It is possible to use some application instead of writing your own but remember that Aodh don’t allow your to change headers or data of the request. So it means that we need to have some simple proxy web server. 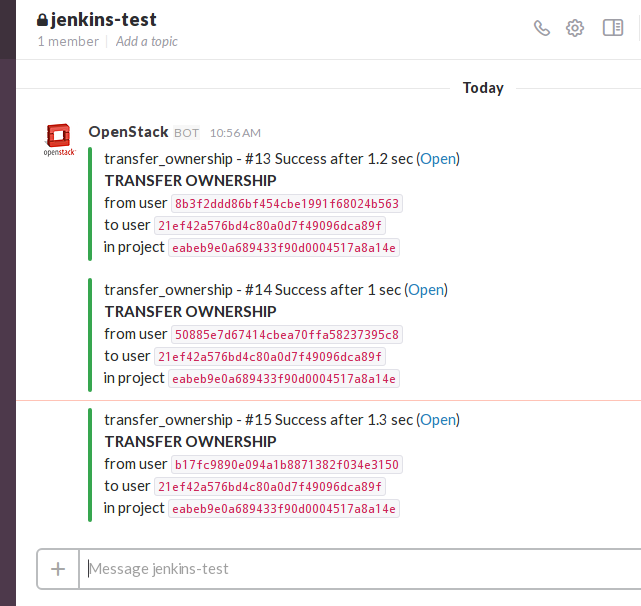 return "Jenkins job was started"
We use Flask(http://flask.pocoo.org/) and Openstack python-jenkins (https://github.com/openstack/python-jenkins) libraries. 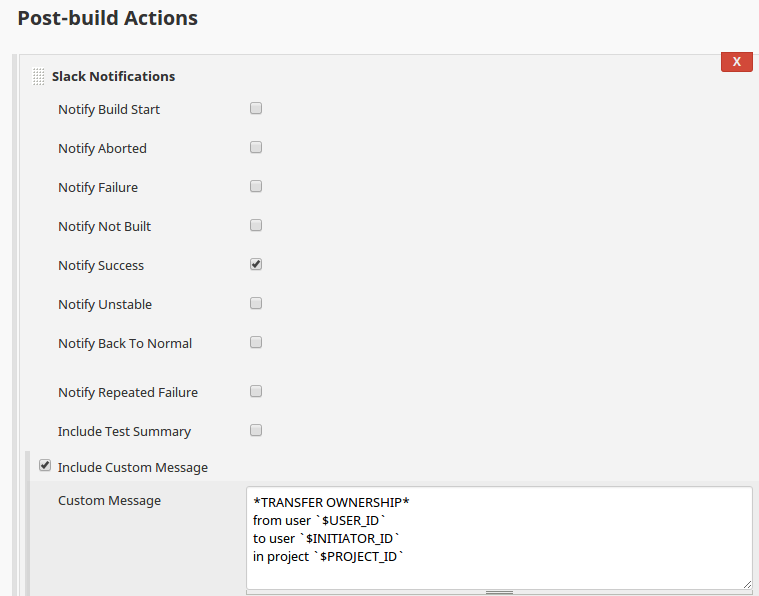 This example web server listen on port 5123 for POST requests and starts Jenkins job “transfer_ownership” with parameters INITIATOR_ID, USER_ID, PROJECT_ID. Here should be a trigger for Nova task “transfer ownership”. 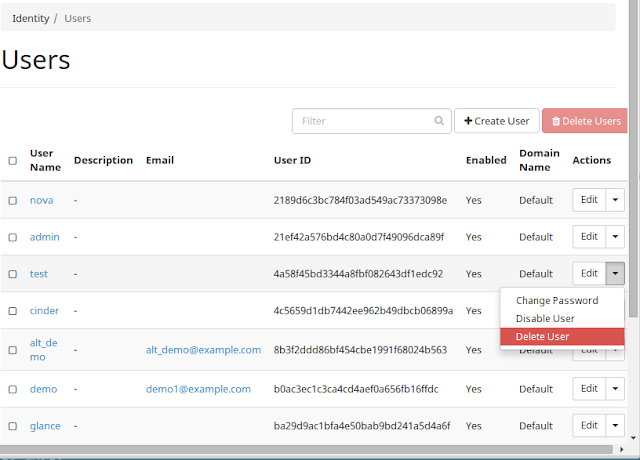 The most reasonable action for deleted user is to transfer ownership of nova entities to other user. We always have an user id and an id of user who perform the action (initiator_id). 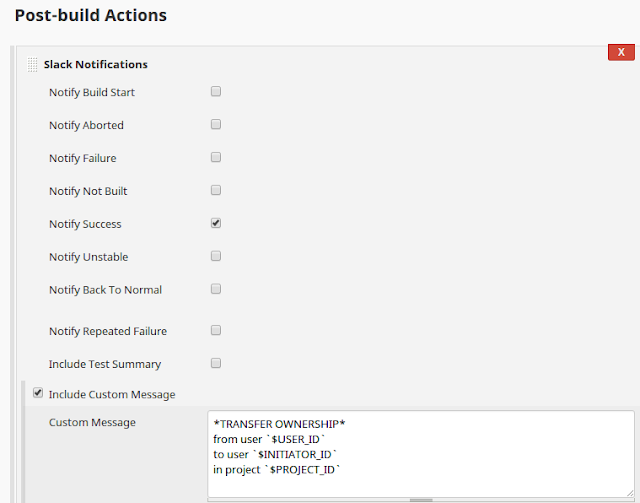 So it looks like a good idea to transfer ownership from deleted user to the initiator. There is a spec in Nova: https://review.openstack.org/#/c/105367/ about transferring ownership. Unfortunately it is an “Abandoned” status right now but it makes sense to update it and to continue work in this direction. 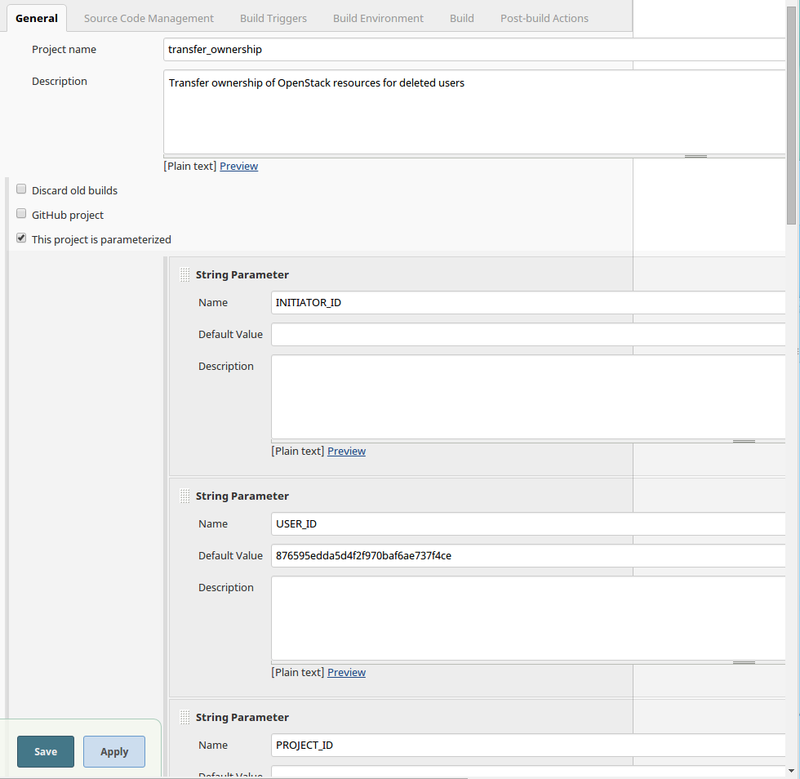 It is possible to configure in the OpenStack notification system that will process notifications about Keystone event like user/project created/updated/deleted. It is also possible to use such notification system to run some post-actions in OpenStack. The most reasonable actions are “transfer ownership” if user/project was deleted or to notify users about Keystone events via messengers like Slack. Right now Nova doesn’t have ability to perform transfer ownership but it makes sense to implement such feature in Nova project. 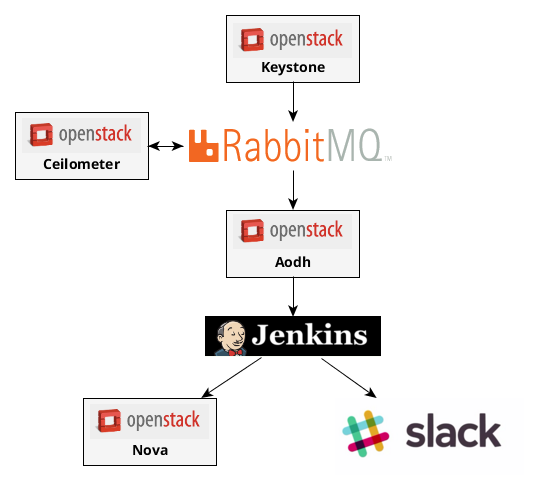 OpenStack Aodh is easy to integrate with different enterprise solutions like Jenkins. With such systems like Jenkins we can cover a large variety of use cases.